I have often wondered, are there initial conditions for making a ‘good painting?’ I think there are. And what’s more, these conditions are the same for doing anything important like redecorating your house, designing a change process for an organization or raising a child. Choices around preparation, control and attachment form important initial conditons for creativity and innovation. When I start a painting session, I take my time to set my stuff up. I lay out my material so I can reach it easily. What I lay out will detemine what I have made at the end of the day. When I set up Phtalo Blue I end up with paintings having a lot of Phtalo Blue. Makes sense? The preparation does not determine the end result, but it determines the journey. And it is the journey that matters…. I get myself out of my comfortzone, allowing the unconscious to become active. I give up control. When I paint, I sometimes use my left hand, I use a brush on a pole. I don’t look at my hand painting, but somewhere else on the canvas. I need to refrain from paying too much attention to the detail. You never get a fine piece from working on the details. The details that matter, will arise from focussing on the whole. When I make something, I don’t want to become attached to it. Or more specifically, I don’t want to become attached to the end result. This allows me to make something surprisingly interesting. So what I do is, I work on many pieces simultaneously. I stay detached from one singular piece. So I can look at it afresh each time I return to it. Or, after a session, I come back to my work later and change it (or ruin it). There is a funny anecdote about Picasso. People responsible for mounting an exhibition are advised to watch the artist carefully to prevent him from picking up a brush and touching up one of his masterpieces. You might say that a particular painting is a finite game but painting as a process is an infinite game. Each painting is the study for the next. 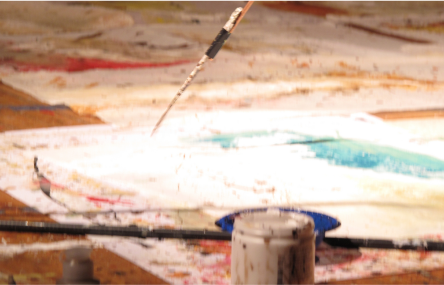 The ‘good’ painting is the painting that lays the foundation for the next painting. With very exceptions, I am not attached to any one of my paintings. This is how I organize my creative work. Setting initial conditions that form a delicate balance between control and freedom to act. How do you set initial conditions when you are about to do something important? Do you think about it in these terms? If you do, how are my initial conditions the same or different from the ones you would use?